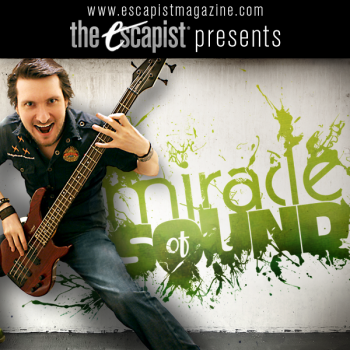 The story behind Miracle of Sound is probably one of the coolest I've heard in a long while. Gavin Dunne began posting his original songs about videogames on The Escapist forums under the username Miracle of Sound. We all fell in love with his catchy tunes just like the rest of you and started producing music videos for his songs to host on our site every Wednesday. Among the following of fans that Gavin has gathered to his Miracle of Sound banner is none other than that Canadian developer of RPGs - BioWare. Next week, Gavin will appear on stage with BioWare staff at GamesCom in Cologne, Germany to answer a few questions and show off the video for his new song. Called "Normandy," the song is based on the plot hooks in Mass Effect 2. This song is not the first time that Gavin has honored the Mass Effect universe as "Commander Shepard" also dealt with the eponymous hero. The video for "Normandy" won't premiere on The Escapist until August 24th so people at GamesCom will get a significant preview. We're also happy to announce that a Miracle of Sound CD with all of the songs that Gavin has written to date including "Mining All Day Long" (Minecraft) and "Wheatley's Song" (Portal 2) - as well as some his earlier songs - will be available to purchase in September. Not only that, but a DVD compilation of the first ten episodes of Miracle of Sound will be available. The Escapist is super-excited for Gavin to appear on stage with BioWare at GamesCom. If you happen to be in Cologne next week, be sure to attend the BioWare panel to see one of The Escapist's own living large like a rock star!